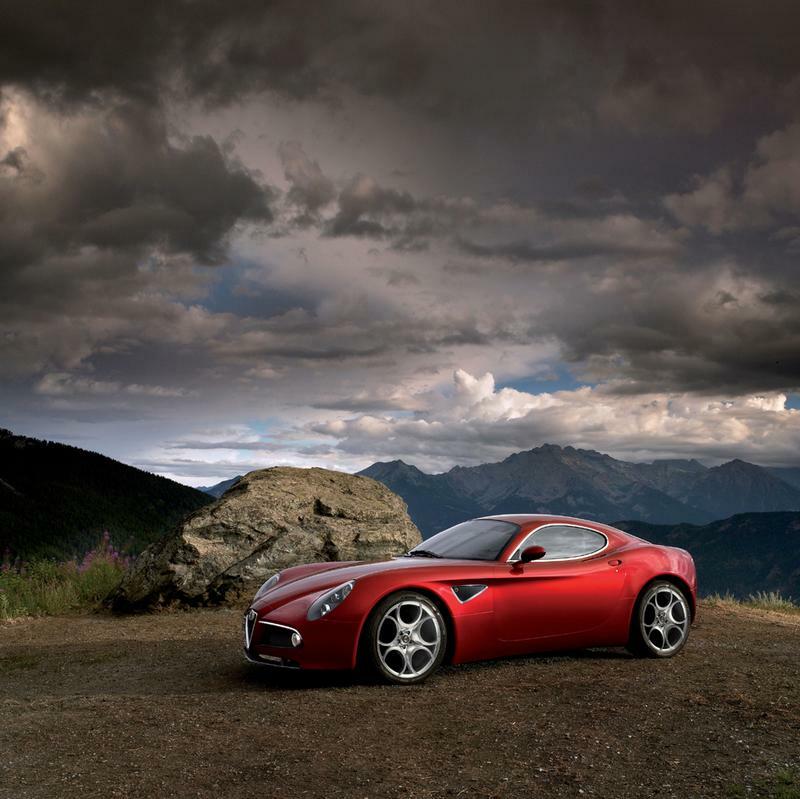 First shown at the 2003 Frankfurt Motor Show the 8C Competizione was a concept car designed and produced by Alfa Romeo's in house styling centre, and it stands out as an icon. 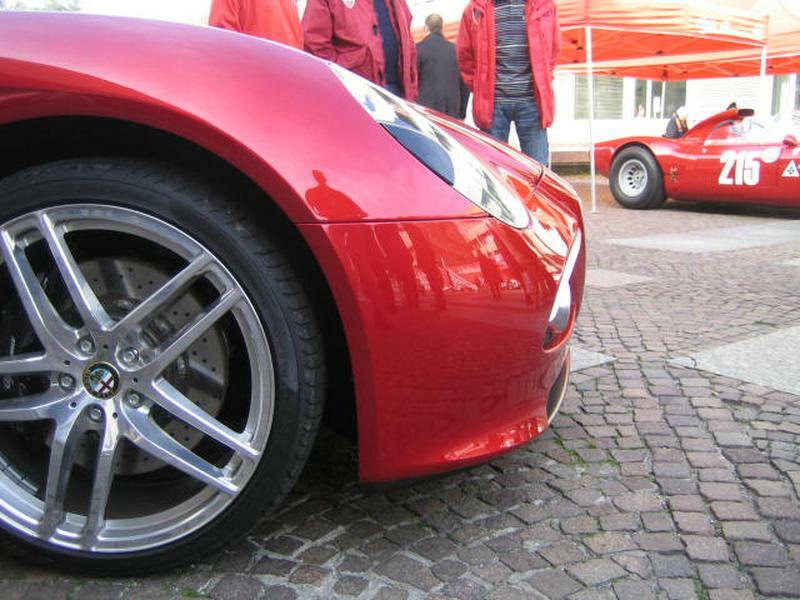 It's very name draws on some of the most evocative models ever produced by Alfa Romeo. The 8C harks back to the awesome straight eight twin supercharged cars of the 1930's designed by Vittorio Jano and Competizione pays homage to the 6C 2500 Competizione driven by Fangio and Zanardi in the Mille Miglia. 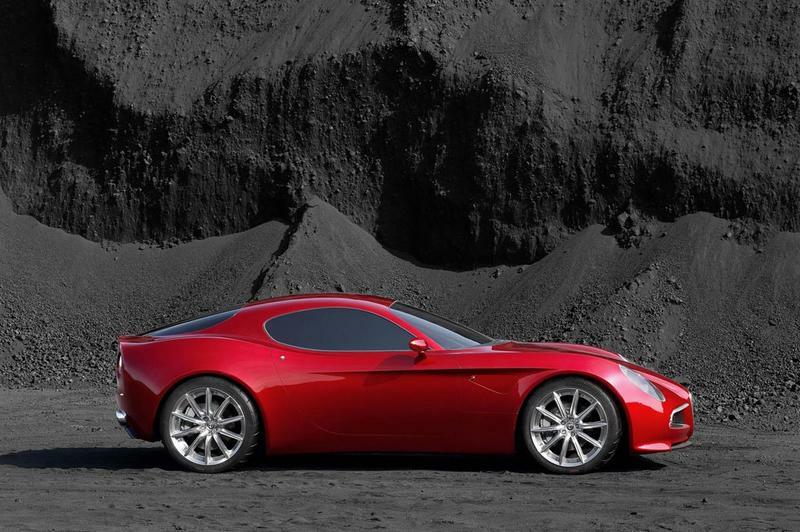 Designed for a production run of only 500 cars the 8C is to be based on the Maserati 4200 chassis. 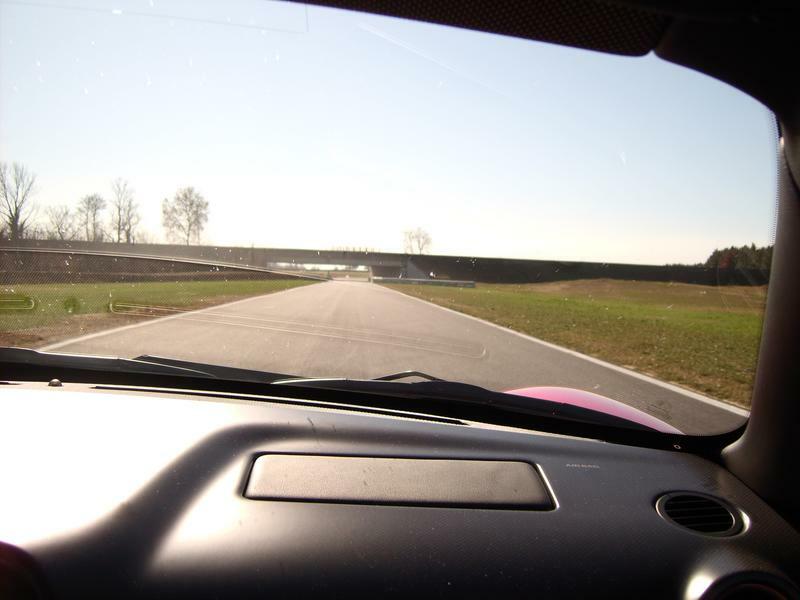 The body is made of carbon fibre in order to keep the weight down to 1400 kg, approximately the same as a Brera and in order to give the car the performance that the styling implies Alfa Romeo borrowed and modified the Maserati 4.2 litre 90 degree V8, by taking the capacity up to 4.7 Litres the power output is increased to 450 BHP, this is then mated to a six speed double clutch robotised trans axle gear box driving the rear wheels. This gives the car a top speed in excess of 300 KMH (186 MPH) with the 0-62 mph dash coming up in just 4.5 seconds. Careful attention has been paid to engine noise to ensure the car sounds good and it is fitted with an exhaust bypass valve to ensure it complies with all the latest type approval legislation. Suspension is by double wishbones front and rear and these have very sporting settings in order to give the car truly awesome road holding through the 245/40 R20 tyres on the front and 275/35 R20's on the rear. Update 03.03.06: Good News! 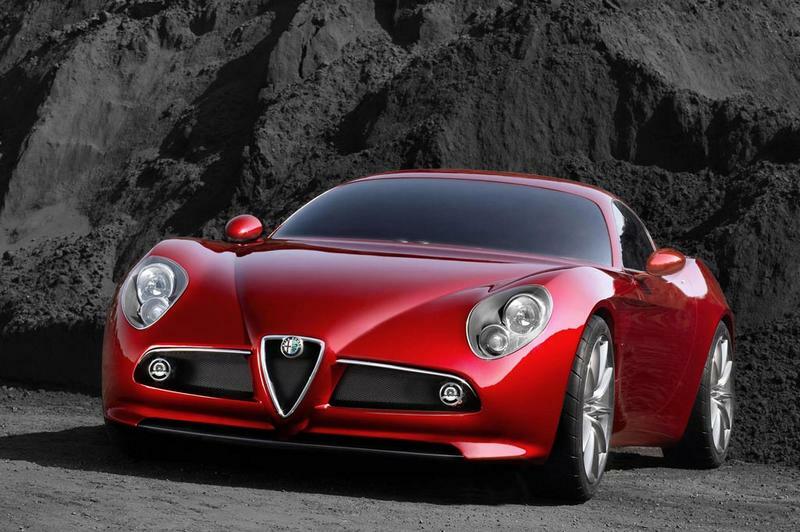 Alfa's recently appointed CEO, Antonio Baravalle, has been quoted by Channel 4 as saying that, assuming that the numbers continue to add up, they are going to put the 8C Competizione into a limited, 500 car production run, with a production ready show car to revealed at the Paris Motor Show in September. Update 03.10.06: The 8C has now been officially released to dealers for delivery late in 2007 this flagship model should do wonders for Alfa Romeo's image worldwide and is a welcome addition to the range. 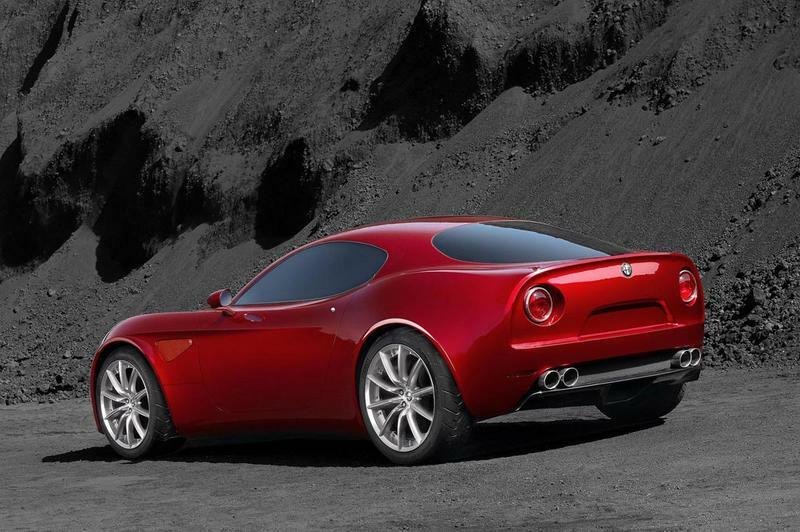 This model will put Alfa Romeo well and truly where she belongs as a manufacturer and let us hope that the other models in the range get a power hike to bring them in line with this stunning car. Update 28.08.07: It is rumored that the 8C Competzione will race at Le mans in 2008, the entry was hinted at in a speech by Antonio Baravelle at the end of the Bologna motor show in December 2007. The 8C is almost ideally suited to be Alfa Romeo’s first entry in the event since the early 1970’s when she competed with the 33 sports prototypes. The 8C chassis will be prepared by Delara with input from Maserati’s racing division who are largely at the end of the development of the Maserati MC12 and are preparing to start work on the 8C and the MC12’s Successor. The 8C will race in the GT2 class against cars such as the Porsche GT3 and it is likely that the 8C will be driven by Maserati test-driver Fabio Babini with Andrea Bertolini, the 2006 FIA GT champion. Update 19.12.07: She is finally with us the press and certain members of the public have been allowed to drive the 8C and at last and we can now give you the full specification of the car. I have waited almost four years to find out how good this car would be and I don't believe that any alfisti could possibly be disappointed with the result. The car is based on the Maserati Gran turismo floor pan, however the rear of the car is a carbon fiber monocoque and the rest of the car is clothed in carbon fiber panels bringing the weight down to just over 1 1/2 tons. The engine is as we predicted a 4.7 liter V8 and produces 450 Bhp with 80% of the torque available from a mere 2000 rpm. 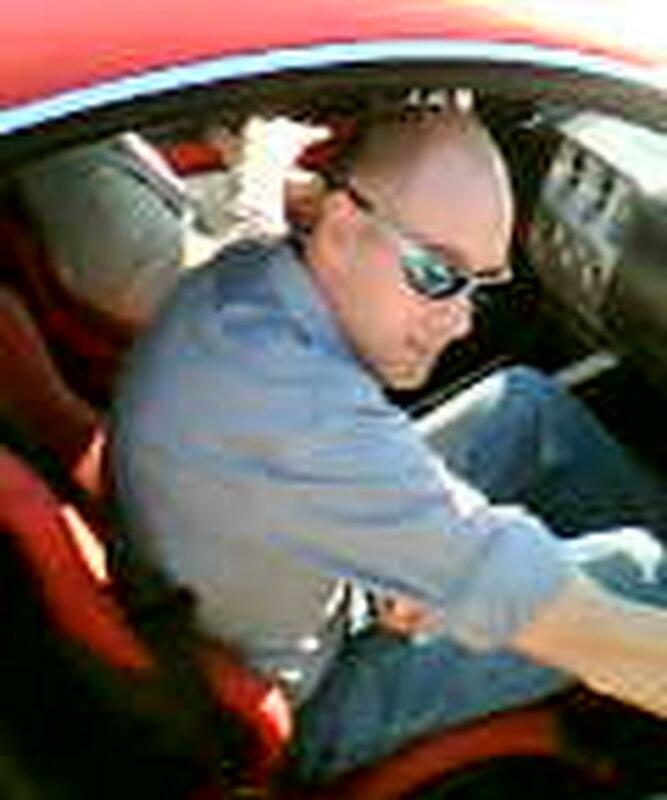 the power is transfered via a torque tube to an updated version of Maserati's Cambriocorsa gearbox and this has been modified to give a quicker gear change. The suspension is double wishbone all round with a limited slip differential at the rear. The body styling is almost identical to the show car and this has somewhat limited the scope of the engineers to improve the aerodynamics, though the undertray has been significantly modified to improve the downforce at high speed they were unable to get the drag factor below Cd .3, which is high. The top speed of the 8C is 182 mph with a 0-60 time of 4.2 seconds even with the comparatively poor drag factor. Detailing of the car is superb, with the quadrafoglio verde badges below the lacquer and the interior is crafted from billet aluminum, carbon fiber and the finest leather. Settling in behind the steering wheel the engine is started by a push button and as the engine fires into life you immediately get the sense of power, a lot of attention has gone into the exhaust system and it is the most glorious sound you will ever hear, better even than the GTV6 engine and if you press the sport button it is simply spine chilling as the management system switches two valves in the exhaust system which bypasses two silencers. The ride is firm/hard as you would expect of a car with this sort of performance and pushing on it just tends to slight understeer, while a sharp prod of the throttle will provoke oversteer which is quickly brought under control by the vehicle dynamic control (VDC) the VDC can be switched of by pressing the button but that is only for the very bravest of driver's. Urgently wanted. As absolutely and totally dedicated Alfisti we have to have this car, our reason for being was to own this car. 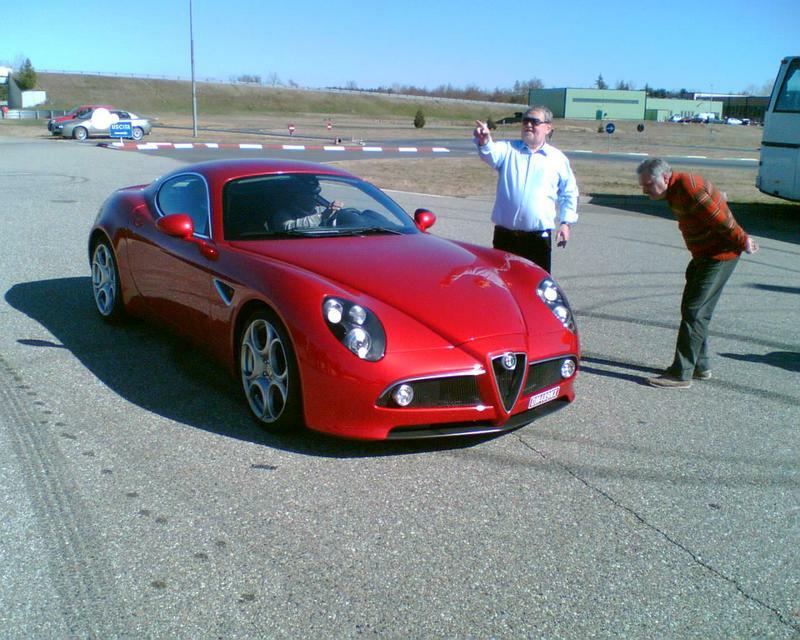 Unfortunately Alfa Romeo UK felt unable to let us have one (we are not worthy!!!) and so if you or someone you know happens to have one and needs (foolishly) to sell it we would be extremely interested.